I've seen many a nice Mizzy for sale on the yahoo Japan auction site and elsewhere for the Japanese market, but at times the Japanese to English translation by Google or other software is spotty, or the auction/sale listing is incomplete regarding country of manufacture. My question is, when a glove has a 2GW model # and is stated to be of NE Kip or Crest Hyde Supreme Elite leather - does this always mean the glove was MIJ? Or are MIC Mizuno produced from these type of leathers too? 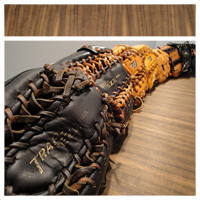 What about the new glove line that begins with 1AJGH versus 2GW model line? TIA for shedding some light! I don't think a 2GW model with Crest Hyde SE leather is Japan. Not even sure if you can guarantee that a NE Kip 2GW is Japan made. That said, i own a few 2GW-17850s, all NE Kip, from Japan and they feel exactly the same quality of construction and leather as my Made in China 2GW-28307 Imperial Kip Leather. How this helps a little. Make sure if you want the quality, get a hardball model.